Sleighbells ring. Are you listening? You still haven’t got your tickets to our concert yet? Well check out our quick Q&A to find out why this is a show not to be missed! 1. Cadogan Hall is a spectacular venue for a Christmas concert. How many Pink Singers will be taking to the stage? There are over 80 Pink Singers, plus 45 from Burntwood School, our orchestra, and all the backstage staff. The venue itself provides a beautiful acoustic stage for the choir, which is enhanced by entertaining visual treats and our world-famous choreography. 2. How long does it take the Pink Singers to prepare for a concert like this? Is there a lot of rehearsal time? We started work in September, so there are a lot of words and music to learn in just three months, and then on top of that there are the dance routines! We meet in London every week for four hours of intense, but immensely uplifting rehearsal. 3. Is this the kind of Christmas concert where the audience will be singing along? Oh yes. Many of the songs will be familiar from the titles, but we think our arrangements – many of which are created by Pink Singers members themselves – will be a beautiful surprise. The harmonies we can produce transform some of the traditional Christmas jingles into spectacular numbers. 4. Are there any ‘non-negotiables’ when it comes to deciding the program for this Christmas concert? Are there any songs that have to be included or any that absolutely can’t be included? 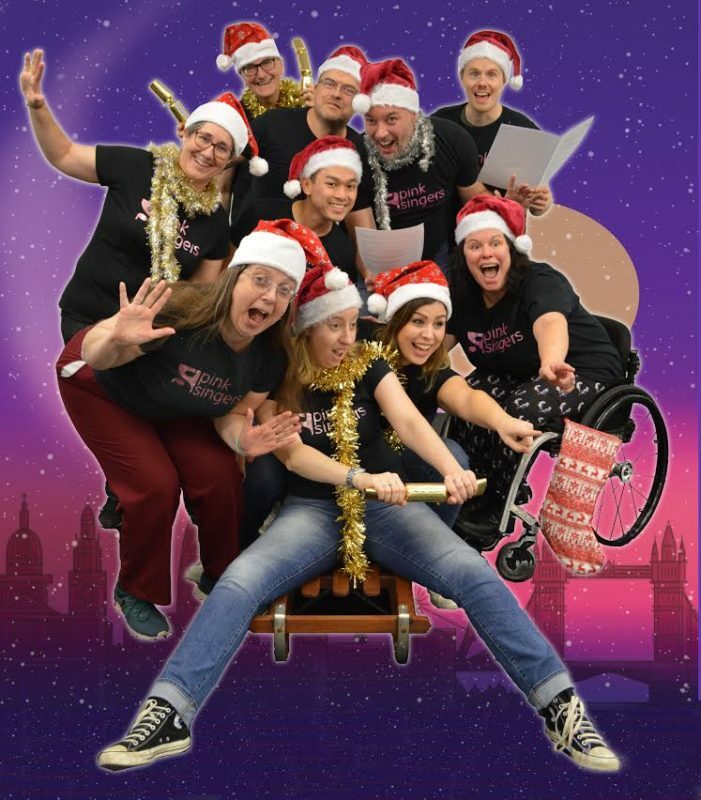 Our two main aims are to create a ’tinsel-tastic, jingle-belling, Christmas-cracking’ show, while at the same time having the most fun in rehearsing every number to perfection. Our musical choices will have to fulfil those two aims. 5. Will there be a rendition of Mariah’s classic? That’s for our audience to find out … but needless to say we have plenty of Mariah fans in the choir! 6. Do you have to be a great singer to be part of Pink Singers? If someone was interested in joining, how would they go about it? Should it be on their list of New Year’s resolutions? We have some really great singers in the choir, but anyone who can sing in tune and pass our simple audition will find that – no matter what their musical experience – the friendly nature of the choir means that you will soon pick up the tools and techniques you need. Put our web site on your New Year’s resolution list, and you could join us for our next fantastic concert. Grab your tickets here for ‘Sleighing It!’ on Saturday 15 December at Cadogan Hall.